Approximately 650 light-years away, a Jupiter-like planet is caught in an uncomfortably tight orbit around its toasty hot host star. Featuring a dayside temperature of 7,800 degrees Fahrenheit, this unfortunate planet is literally vaporizing, and it has sprouted a distinctly comet-like tail. Astronomers say the planet—the hottest giant exoplanet ever discovered—is not long for this world. Our Universe is filled with extremes that boggle the imagination, and each time we think we’ve discovered the limits of what nature can produce, we find something that takes it to another level. Case in point, planet KELT-9b—a gas giant that’s literally hotter than some stars. Astronomers have never seen anything quite like it. making a complete orbit once every 1.5 days, and traveling no farther than 0.03 AU, or 2.8 million miles. KELT-9b is over twice the size of Jupiter, but it’s only half as dense; the extreme radiation from its host star, KELT-9, has caused its atmosphere to inflate like a balloon. This Jupiter-like planet is also tidally locked, meaning it has a side that permanently faces its host star (in the same way our Moon has a side that’s always facing Earth). The dayside surface of the planet is blazingly hot, featuring temperatures around 4,600 Kelvin (around 4,327 degrees Celsius, or 7,800 degrees F). There’s so much radiation bombarding KELT-9b that molecules such as water, carbon dioxide, and methane cannot form. The tremendous heat is causing the planet’s molecules to break apart and its atmosphere to evaporate. Now the hottest giant exoplanet known to science, details on KELT-9b can be found in the journal Nature. 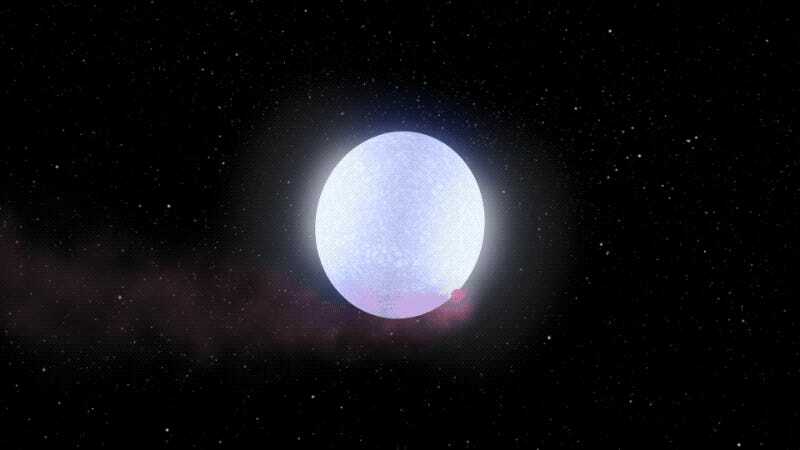 KELT-9b was discovered by astronomers from Ohio State and Vanderbilt universities using the the Kilodegree Extremely Little Telescope (KELT) Northern observatory (KELT-North) at Winer Observatory in southern Arizona. This telescope provides a low-cost means of planet hunting by using mostly off-the shelf technology (such as a high-end camera lens instead of a mirror to collect light). So whereas a traditional telescope costs millions of dollars to build, the hardware for KELT, of which there are two, runs for less than $75,000. In 2014, astronomers using KELT-North detected a tiny dip in KELT-9's brightness, suggesting a planet may have passed in front. 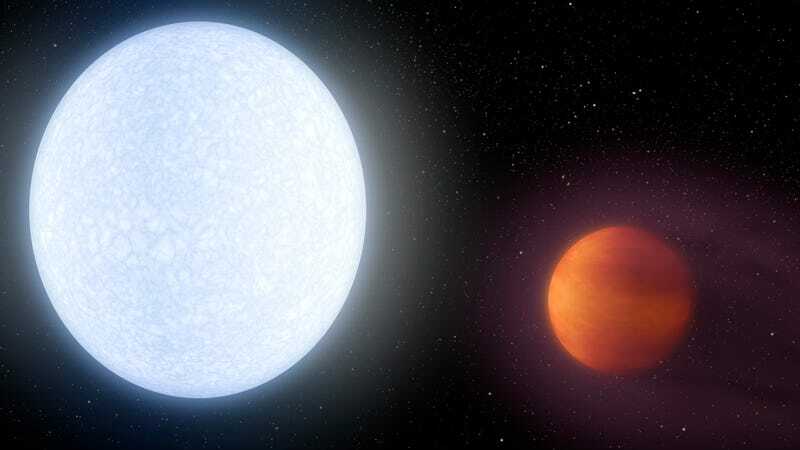 Subsequent photometric and spectroscopic observations confirmed the signal was a “hot Jupiter.” Follow-up observations were also taken by citizen scientists using small telescopes. To date, astronomers have documented thousands of exoplanets, but only six (including KELT-9b) have ever been found to orbit a so-called A-type star—a scorchingly hot brand of stellar object with temperatures between 7,300 and 10,000 Kelvin. By comparison, our Sun is about 5,770 Kelvin. No planets have ever been found around B-type stars, which are the hottest stars in the galaxy. At 10,170 degrees Kelvin, KELT-9 is actually somewhere between an A-type and B-type star. Incredibly KELT-9b is a mere 1,200 Kelvin cooler than our Sun, and as hot as some K-type dwarf stars. The previous hottest giant exoplanet was measured at 3,300 Kelvin, orbiting a star with a temperature of 7,430 Kelvin. As for the hottest exoplanet regardless of size, that distinction goes to Kepler 70b, a small, rocky planet with a surface temperature of 7,143 K (6,870 degrees C, 12,398 degrees F). The extreme ultraviolet radiation bombarding KELT-9b is causing its atmosphere to bleed into space, and it probably has a glowing gas tail reminiscent of a comet. As study co-author Scott Gaudi from Ohio State University told Gizmodo, the future prospects for this planet are not good. Looking ahead, the astronomers would like make further observations of the system with other telescopes, including Spitzer, Hubble, and eventually James Webb, which launches to orbit next year. “We are trying to use every tool at our disposal to unravel the mysteries of this truly strange and fascinating system,” Gaudi told Gizmodo. Among other things, the astronomers would like to see if the planet really does have a cometary tail, and to better estimate how long the planet will survive. Needless to say, the chances of life emerging on this radiation-soaked hell hole are about as close to zero as it gets, but Gaudi says it’s still worthwhile for scientists to study such systems.